Is the Rapture of the Church the same as the Second Coming of Christ? Dr. Reagan: Every time a new year begins my heart fills with hope that it will be the year of the Lord's return. So, what about this year? Could Jesus really return this year, or are there prophecies that must be fulfilled first? If Jesus were to return, what would happen? Would time come to an end? Would the earth cease to exist? Would you be struck dead or given a new form of life? When first talking about the possibility of the Lord's return this year, are we referring to what most people call the Second Coming? Dennis Pollock: There's a difference between the Rapture and the Second Coming as we all believe. Let me share just what the Second Coming is and contrast it with the Rapture. The Apostle John describes the Second Coming of Christ as a time when He comes back to rule the earth. John wrote, "I saw heaven open, there was a white horse and on the horse was Him who was called faithful and true." John continues, "In righteousness He judges and makes war." You get a very militant sound there. John describes Jesus as His eyes are like a flame of fire. On His head are many crowns. He is clothed with a robe dipped in blood. The armies of Heaven are following after Him. And, out of His mouth goes a sharp two-edged sword that He is going to use to strike the nations. He is going to rule with a rod of iron. So, Jesus returns as a conquering warrior. John uses a military type language here. In contrast, when you think about the coming of Christ for the Church, which is what we call the Rapture, it's a love experience. It's a bridegroom coming for His bride. Now, imagine you are at a wedding and suddenly you see the bridegroom standing there waiting for His bride. He's wearing a camouflage army uniform. He has a rifle in his hand and has hand grenades on his belt. He has a knife between his teeth and he is growling like he is ready to bust someone's head. Well, you would say, "Hey, Guy, go on home and put on your tux! You are not dressed appropriately for a wedding." And so, John's language here in Revelation is not really appropriate language for a bridegroom coming for His bride. When we talk about the Rapture then, we are talking about how Jesus promised that He one day is going to come and gather you to Him. He said, "I will come and I will receive you, where I am you maybe also." This is the Rapture of the Church. Dr. Reagan: So, when we talk about the possibility of the Lord returning this year, we are not talking about the Second Coming? 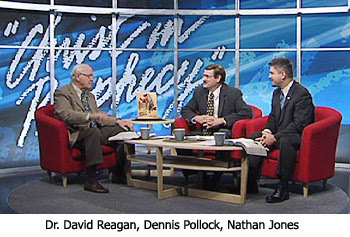 Dennis Pollock: No, there are a number of prophecies that would need to be fulfilled for the Second Coming, and that's what tricks a lot of people. They claim things like, "We know Christ couldn't come now because not all the earth has heard the Gospel. And, there isn't a Temple built. The Antichrist hasn't shown up yet. There are just so many things." But, those are related to the Second Coming. Indeed, the Second Coming couldn't occur this year as there is too much prophecy yet to be unfulfilled. In contrast, the Rapture could occur today and that's always been the case because it's an imminent event. The Rapture is something that we should always look out for. Nathan Jones: Definitely, the Second Coming and the Rapture are two different events aimed at two different audiences. You can look at the verses for the Rapture which are clearly John 14, 1 Thessalonians 4 and 1 Corinthians 15, and when you read those verses they tell a different story than the Second Coming verses which are Matthew 24, Luke 21, and Revelation 19. They are two totally different stories. For example, when Jesus comes back for His Church, the Church is brought up to Him in the clouds. Jesus will be waiting in the clouds. But, when Jesus returns He brings His armies which are comprised of those people He had already raptured. Secondly, when Jesus calls us at the Rapture, He brings us up to Him, but when Jesus returns He actually lands on earth. Jesus lands on the Mount of Olives and it splits in two. And, thirdly, Jesus is coming for His Church which of course is already saved, but when He comes back He is coming to bring retribution against those who are unsaved. He is coming to judge, so again, two totally different events. Dr. Reagan: So, what the two of you are saying is that if we talk about the return of Jesus this year, like when I talked about how I yearn for the coming of the Lord, we have to be talking about the Rapture because there are too many prophecies that have to be fulfilled before the Second Coming? Dr. Reagan: The Bible tells us that the return of Jesus if imminent. What does that mean? Nathan Jones: It means the Rapture can happen at any time. Nothing has to happen before it comes. There are no signs and there are no prophecies that must happen beforehand. Dr. Reagan: So, would you go as far as saying then that there's not one prophecy that has to be fulfilled for the Lord to come in the Rapture? Nathan Jones: Exactly right! Now, some people will bring up Matthew 24:14 which says the Gospel has to be preached to the whole world and then the end will come. Well, that again is a Second Coming prophecy. That is not a Rapture prophecy. During the Tribulation the Lord provides all sorts of people to share the Gospel. He's got an angel who travels all over the earth. He's got the Two Witnesses in Jerusalem and the 144,000 Jewish evangelists. He's got all the materials that we've left behind. There's definitely a great Gospel movement during the Tribulation. Again, this great evangelistic witness happens during the Tribulation, and so the Church doesn't need to be in the Tribulation to share the Gospel. God's got it covered. Dennis Pollock: Speaking of imminence, I want to go back to the Old Testament institution of the Passover. God said something very interesting to the Israelites through Moses when they had that first Passover. He told them how they were to eat the meal. They couldn't just eat it anyway they wanted. God said they were going to eat the meal with their belt around their waist. He said they were going to eat the meal with their staff in their hand and their sandals on their feet. God said they were going to eat it in a hurry. God said He wanted them to eat it in haste. Well, what does all that speak about? It speaks about the fact that they were to be ready to leave at anytime. When you come home you usually take your belt off. You take your sandals off your feet. You wouldn't wear them in the house, and you certainly wouldn't eat a meal with a staff in your hand. But, God says to Israel that He wants them to be doing all of this knowing that their time here would be short. They would be leaving at anytime. I want us to contrast that with what Jesus says concerning His own coming. He says, "Let your waist be girded, and your lamps burning. And you yourselves be like men who wait for their master, that when he'll return from the wedding," and again we have the idea of a wedding, "He will come and knock and you will open to Him immediately." So, Jesus is telling us be in a state of readiness for Christ could come at any time. That's the idea of imminence. The idea is that you should always be ready for you don't know when. Jesus said that clearly to watch and be ready for the Son of Man is coming when you don't expect Him. He told us to be ready because we don't know the day or the hour of His return. The idea is that you should live in such a way that if He came this second or next day or whenever, you will be ready. That's the idea of imminence. That's why we have to allow for Christ to come at anytime. If you wake up in the morning and your theology says that Jesus couldn't possibly come today because of this prophecy not being fulfilled nor this other one because certainly we have to win more souls and we have this and that to be accomplished, then you are not anticipating Jesus' return with imminence. So, admit that you know one thing — you know you don't know all that today will bring. Those who say that Jesus couldn't possibly come today are breaking the express command of the Lord Jesus who said to watch for He is coming at anytime. Jesus' return for the Church is an imminent event. Dr. Reagan: So, in summary, what the two of you are saying is that the return of the Lord is going to be in two stages. First, the Rapture of the Church is when Jesus appears in the heavens and we go up to Him. Jesus doesn't even come to the earth. And, secondly, when we return with Him to the earth that's what's called the Second Coming. And, when we talk about the possibility of Jesus returning this year, we are talking about the possibility of the Rapture of the Church occurring at any moment as it's imminent. Let's hope the Rapture happens this year. I'm ready to get out of here! In the next part of this series on yearning for Jesus' return, we'll look at the Bible's teaching on the Rapture. When I get impatient waiting for the Rapute, you're right, I have to remember that is more time for an unbeliever to come to know Jesus. On the other hand, after the Rapture, as events play out, those event will also prompt people to come to Jesus. I really have trouble understanding why a Bible believing church has a hard time standing on this doctrine of the Groom returning for His Bride, also called the Rapture of the Church, and also the Christian's Blessed Hope. It is like they are afraid they might be wrong which is a warning of the way it will be in the last days. We are to look forward to this event with great anticipation and we don't even preach of it's significance. The reference that Dr. Reagan provides here documenting what he believes is in support of the Doctrine of Imminence is clearly an error revealed in the very verse he provides, "Let your waist be girded, and your lamps burning. And you yourselves be like men who wait for their master, that when he'll return from the wedding,". You will notice here it illustrates the Lord returning from the wedding, so obviously the audience here being addressed is not the Church! You are mistaken as this is a literary device. Jesus is using a rhetorical expression to describe the need to be alert and watching for when He returns. The term is ‘LIKE’- homoios- meaning resembling; Jesus is comparing a familiar image of the day to emphasise the need to be ready to go, it is definitely a passage of imminency. The wedding and the bridegroom is a similie; not THE wedding and THE bridegroom. In modern day it could be described as having your hat and coat on, ready for the taxi to arrive at any moment. This is imminence. I have several problems with the teaching that the resurrected and raptured saints will come to earth at the end of the Antichrist's reign. The conventional understanding of prophecy students is that there is a coming WITH the saints following a coming FOR the saints (I Thessalonians 4:16,17) by 7 years (pre-trib), 3/1/2 years (mid-trib) or immediately (post trib). 1. There is strong evidence that the coming WITH HIS SAINTS is a mistranslation appearing only in the King James Version of the Bible. In other versions it is WITH HIS HOLY ONES. Holy Ones in the OT are the angels who were immensely powerful and brought mass destruction on the enemies of Israel. The Old Testament righteous, such as Abraham, David and Daniel, did not join the angels. Their desstination was heaven. 2. In Zechariah 14:5 it is only the angels that come to earth. There is no indication or good reason that resurrected and raptured saints will be among them. The angels come to fight and there will be a great earthquake when Jesus' feet land on the Mount of Olives. Jude 14 echoes that the Lord comes with his Holy Ones to execute judgment on the wicked. 3. The coming of all of the inhabitants of heaven to earth is logically and intuitively troublesome. Revelation 19:11-16 shows Jesus and His armies of angels about to tread the "winepress of the fury of the wrath of God." In what way could the tens of thousands of angels use the help of the weak­-by-comparison hundreds of thousands who will have resurrected human bodies. In fact would they not get in the way of the angels doing their job? Would there even be room for them all in the environs of Jerusalem? It would be a massive logjam. 4. And then what: do the saints stay and watch the vultures enjoy the Supper of God, then return to heaven, or maybe wander on earth till Jesus shows them what their earthly duties are? 5. Few or no details are given regarding how we are to rule and reign with Christ. The ruling and reigning would have to be from heaven. That is where our mansions and God's throne are. I would not expect an earthly office. Comparing numbers, it would seem that just a very small percentage of us will actually have significant jobs on earth. The interpretation that we come with the angels to earth after the resurrection/rapture has to be only a very poor guess! The OT saints, the heroes of faith chronicled in Hebrews Chapter 11, acknowledged that they were aliens on earth and looked forward to a better country--a heavenly one. Verse 16. 6. Another serious problem in this scenario: The promises for the Church are different from the promises to Israel. The promises to the Church are heavenly promises (for example, John 14:2) while the promises to Israel are earthly. We cannot even imagine the glorious existence awaiting us in heaven Trying to merge the destiny of the saints with that of Israel at this point of time is premature. The Jews will be regathered to Palestine and have the blindness removed from their eyes concerning the Messiah, the one whom they have pierced. Zechariah 12:10. All the nations will be required to go to Jerusalem each year for the Feast of Tabernacles. This is the last of Israel's seven annual prophetic feasts still to be fulfilled concerning God's redemption of Israel, the first one being Passover on which Jesus shed his blood for our sins. This seventh feast could be well fulfilled by the coming down from heaven of the New Jerusalem at the end of the 1000 years, with the Father tabernacling with his people for eternity. 7. This opens up a final question, seldom addressed: How will the Feast of Trumpets (Rosh Hashana) and the Feast of Atonement, Yom Kippur be fulfilled?